I have for the past 15 months been exploring Coul Links through my photography. In the many hours spent traversing this land I have also discovered places interesting on a smaller scale, some hidden and some not, but which I could photograph in a more intimate way. This new work is intended less to inform, but to rather evoke. It is a way of saying something about a place without revealing where that place really is, of transforming place into space so the photographs acquire a universality, or a sense of familiarity tied to each viewer’s own experience. By creating visual and aesthetic interest in the image and in some cases using reflections or the absence of horizon to create a bit of disorientation or ambiguity that requires the viewer to linger longer over the image to decipher it. There is not generally intended to be a principal focal point in the images, and they are rather meant to be taken as a whole, with elements of interest across the entire frame (Figure 1). My landscape work, not uncommonly, is absent people and yet I as the photographer am always there, not in the final frame, but only just out of it. It is in this creative space just behind the lens that the interactions of camera and photographer combine through the choices made to capture a moment in time and space. It is in this creative space that I begin the dialogue with a viewer of my work. Liz Wells proposes, “… our relation to the environment in which find ourselves, and of which we form a part, is multiply constituted: the real, the imaginary, the symbolic, memory and experience, form a complex tapestry at the heart of our response to our environment, and, by extension, to landscape imagery.” (2011: 2) I believe we are intractably connected to the world around us, and while it seems as more and more people move to more urban settings that they become disconnected from the wilder places, they remain part of Nature. And yet for many, the only feeling of connection to the natural world beyond the cities comes from images and the responses those images stimulate in the viewer’s imaginations. I created images that are real, but that will also evoke memories and stimulate imagination. My relationship with nature and place, as a person and as a photographer, is fundamental to who I am and when I choose to take a photograph, I do it because there is meaning for me. But each of our journeys are unique and I want this work to trigger memories, inspire reflection and stimulate the imaginations of those who view it. As Allan Sekula states “The photograph, as it stands alone, presents merely the possibility of meaning”. (1982: 91) My photograph is the opening gambit in a dialogue with the viewer, where it is now to each one to bring their own meaning to what they see as they ask questions such as “Where is it?”, “What is it”, “Have I been there or does it remind me of somewhere I have been?”, “What do I imagine lies beyond the edge of the photograph?”, and as they examine the emotions and ideas the photograph stimulates (Figure 3). “The Japanese have a unique understanding of landscape. The term for ‘landscape’ in Japanese is fükei, which combines the notion of ‘flow’ or ‘wind’ (fü) and ‘view’ or ‘scape’ (kei) – hence ‘flowing view.’ Landscape is not considered static, but transient, ephemeral, never stopping. The flow of time is a vital part of this understanding in the Japanese arts, time’s passage in nature, and the changing seasons, are central motifs.” (Vartanian, 2006: 42) When I release the shutter, I am of course completely aware of time and place, of the before, the after, and the during that results in my photograph. This is yet another aspect of ‘flow’ inherent to photography. The photograph is but a momentary peek into constantly changing scene. By choosing to frame more closely, I take what is a known and concrete time and place and abstract for my viewer a space that is relatively timeless. The photograph in Figure 4 conveys a palpable sense of movement and flow caused by wind and a more subtle hint at the flow of the change of season without ever revealing precisely where or when it was taken. “A photograph shows only a single moment in time. Yet when viewing a photograph, one is strongly aware of the flow of time to which this moment belongs. Even when viewing a still image time does not stand still. When we give ourselves to the act of seeing, incoherent memories and thoughts of all kind come to mind, accompanied by a swelling of emotion. Herein lies the richness of seeing.” (Suzuki, 2015: 009) There is an unspoken distinction being made between the act of looking and the act of seeing. “In Zen philosophy the mind should be a window, rather than a mirror, so that the world is seen directly and not through the filters of the intellect.” The Zen monks “absorbed themselves in the activity rather than in their ego’s understanding of the activity.” (Juniper, 2003: 26) To me, this is the essence of true seeing and to which as a photographer I aspire. To be able to be fully absorbed in my surroundings and with the full scope of my senses, feel that it is time to release the shutter is when I have achieved harmony between myself, my camera and the world before me. Axel Hütte, Daniel Gustav Cramer and Risaku Suzuki all inform my work. Each has done a variety of prior work and each has done work quite similar to that which I am currently doing. Hütte, a Dusseldorf School contemporary of Andreas Gursky and Thomas Struth, brought me an awareness of a different way to represent a place, a way that made that place become “space”, somehow bigger than life, and that by reducing the frame the relevance expanded in both time and space. Hütte’s early works were his night cityscapes which were striking, geometric and starkly absent the people that inhabited those spaces, but it was his later landscape work that caught my eye. “There isn’t any kind of story behind the pieces. The viewer is lost in time and space, sucked into the beautiful world of photography. He will sometimes use a reflection on the water just to irritate the viewers, so the flames of their imagination could shine brightly. There is no need for any detail in the photographs to be rendered or treated specially, as the image is viewed as a whole, without emphasis on any of its parts.” (Widewalls, 2018) This notion of no story is important and one which Suzuki, Cramer and I have also adopted. To caption or provide words removes the possibility for the viewer to create their own story for each photograph and the dialogue becomes instead a didactic. of beauty to create an image that stimulates imagination, that I am working toward. Daniel Gustav Cramer’s Trilogy series is an even more contemporary and superbly representative example of my intentions; “images shot through with story and place, but which demand we ignore both place and story. This is what we are, they say, but what are we?” (Darwent, 2007) It happens by coincidence that I have been working with my own trilogy of the dunes, glades and dune slacks. 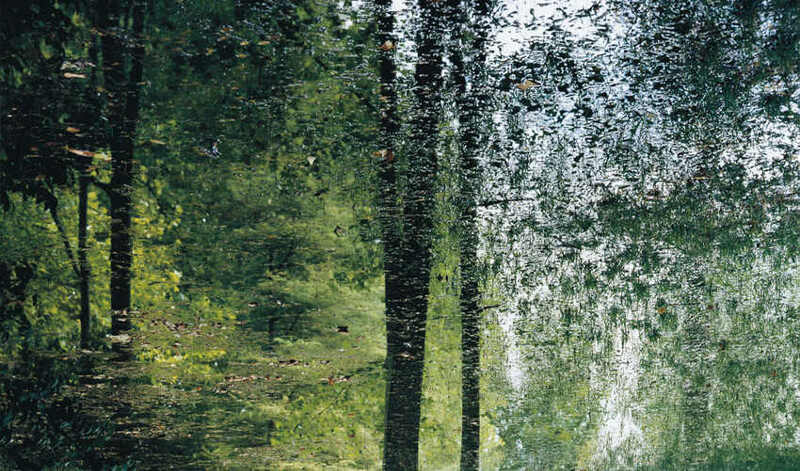 Mitsuda continued: “When the photographer tosses a rock into the water, the rock creates rifts and turns the water inside out, rustling the surrounding trees. A fluid image resembling an abstract painting appears in the photograph…When the water surface is cut up by a fallen tree, moving water is juxtaposed against still water, bringing disparate temporalities of the material in contact with each other and producing details that fascinate endlessly.” (Suzuki, 2017) My photograph in Figure 8 illustrates the abstraction effect of the rippling water to which Mitsuda refers. There is indeed an interesting departure from the still water reflection that in the series provides a visual counterpoint and adds an additional layer of abstraction and interest across the frame, and it is an example of a photograph I thinks successfully captures my intentions. Nature’s nearly endless array of subjects exist in transitory states dictated by light, dark, weather, seasons, time, elements, life, patterns of growth, and death. These phenomena are universal and every person on Earth is aware of them. Photographs that capture fragments of these elemental truths resonate with viewers because it reminds them of similarities to their own experiences. Hütte, Cramer, Suzuki and my current work all abstract from reality just enough to create in the mind of the viewer questions. Are Hütte’s or Cramer’s mountaintops in Europe, Asia, America? Are my glades along the eastern US coast, a tropical island, or Scotland? after stills to emphasise the transience of the moment I choose to release the shutter and make a point just how dynamic the environment can be. The fundamental nature of this portfolio is in some ways more impressionistic and occasionally moderately abstract than any of my previous work, which of course changes the potential audience from that of my earlier more documentary and science-based work that aligned more with the Modernist aesthetic. This work, while still very much about a place, has successfully masked its actual location and could easily be abstracted to a place in a viewer’s memory or imagination. This work is well suited to larger scale prints that on a wall would allow a viewer to almost feel if they were in the place. I have also incorporated a few short video clips to give an even more complete sense of place which could be looped on video screens or projected nearby the large-scale prints. As demonstrated by practitioners like Hütte, Struth, Suzuki, Cramer, Murray and others like Southam, there is clearly an interest in and a market for this type of work, when and if it can garner the attention of a gallery or publication, and subsequently a buyer. It is also work that could be adapted to a book. It would be done with full page or double page prints and no accompanying titles or captions. Possibly a short essay at the end could be included to talk about the making of the work along with a table of the plates and their catalogue numbers for reference. But remembering that my intent involves allowing the viewer to create their own narrative is the reason behind minimizing any influence on their interpretations. Peter Henry Emerson wrote “The value of a picture is not proportionate to the trouble and expense it costs to obtain it, but to the poetry that it contains.” (in Trachtenberg, 1980: 102) In my introduction I noted the photographer is always present if only just out of the frame and it is in that creative space just behind the lens that the interaction between the camera and photographer combine through the choices made to capture a moment in time and space. Risaku Suzuki wrote: “When we give ourselves to the act of seeing, incoherent memories and thoughts of all kind float to mind, accompanied by a swelling of emotion”. (Suzuki, 2015) My interactions and choices have resulted in photographs that reflect my unique journey through the world and my way of seeing and representing a place. It is my hope that I have indeed created some visual poetry and thereby stirred the memories and imaginations of others with this work. WELLS, Liz. 2011. Land Matters: Landscape Photography, Culture and Identity. London; New York: I.B. Tauris. STERNFELD, Joel. 1996. On This Site: Landscape in Memoriam. Chronicle Books.